It was wedding season and a big gang of us were visiting the city of Jabalpur in Madhya Pradesh for a fun wedding. North Indian weddings are usually in the evenings leaving the day free, with the main wedding going on till wee hours in the morning. We reached a day before the wedding after a long train journey from Mumbai to Jabalpur. After a night of partying at the Sangeet a day prior to the wedding, we decided to visit the nearby Bheda Ghat and see the river Narmada. Leaves droop, dogs lie languidly in the middle of roads, birds come by the flowerpot in the balcony attempting to siphon off the few drops of water that haven’t yet evaporated, Taxiwallahs sigh as they use their napkins to wipe off that unending stream of perspiration, and the only happy person that seems to be quite happy with the oppressive heat is the ice-cream vendor where a steady stream of people make their way to at all times during the day. A few days away from this sweltering heat is what I wanted! With a few holidays in sight, we explored options to go to near Mumbai for an extended weekend to a nearby hill station other than Matheran, Mahabaleshwar and the other usual suspects of Lonavala-Khandala that have become as bustling as Mumbai itself during summer. I also longed to go somewhere clean, green and a place that had good roads. After much procrastination, we finally zeroed on the hill station of Mount Abu in the state of Rajasthan which seemed to offer peace, fresh cool air and relief from the sweaty dirty megapolis. Mount Abu is the highest point in the Aravalli mountain range at about 1220m above sea level making it a cool getaway from the searing summer heat in Rajasthan, nearby Gujarat and Mumbai! Mount Abu is accessible by excellent roads, trains and is about 3 hours away from the nearest airport at Udaipur. Mount Abu is conveniently located at about 750 kms from Mumbai (11 hours by train or road), and at about 230kms from Ahmedabad and 170kms from Udaipur. One can have their pick of mode of transport of trains, driving down, taxis and buses from major cities. After a hasty tatkal booking, we were finally on our way to Mount Abu one evening. The next morning the train chugged along to Abu Road station which seemed to be quite a busy station with several tourists like us getting off and on. On getting out, taxiwallahs immediately hounded us to take us up the hill station. A few minutes later, we grouped up with a family going the same way and we were on our way for Rs 500 for the taxi. A few curvy roads later, we reached our hotel and were content in whiling away our time for the rest of the day at the peaceful resort in the very pleasant weather. A leisurely stroll down the road took us to one of Mount Abu’s main attraction, the Nakki Lake. The market near Nakki Lake is a bustling hub of activity where one can get everything from traditional jewellery, garments, bedsheets, artifacts and souvenirs at good prices. Plenty of restaurants dot the little market and all seem to do brisk business! The market side of the lake is in no way tranquil or peaceful with hordes of tourists, eateries, hawkers and boatmen creating plenty of noise. However, a walk around the lake brought us to several peaceful perches from where we could smile at the hullaballoo on the side of the twinkling lights of the market place. For suggested walking and trekking routes/maps visit the Tourist office nearby. Our day ended in the hotel sitting outside in the evening without the ubiquitous mosquitoes bothering us and enjoying the cool breeze. The holiday was just as it was meant to be – relaxing and cool! The next day, after a morning of lazing around, we decided to venture out to see what was touted to be even more beautiful than the Taj in its interiors – The Dilwara Jain temples. These breathtaking temples were ‘paisa vasool’ for the whole trip! On the outside, they seemed to be like any other, but once we entered the sanctum, we were awestruck by the magnificence of the artwork. I have never seen such intricate workmanship ever before. Such finesse, such grandeur and such beauty carved in marble. The Dilwara temples were built between the 11th and 13th centuries and consist of five major sections or temples devoted to the five tirthankaras of Jainism. Each temple is decorated with intricate marble carvings of Jain saints, flowers, petals and designs on ceilings, pillars and temple walls. One can get quite a crick in the neck staring up at those gorgeous chandelier designs on the ceilings! Unfortunately, photography is not allowed inside the temple and you have to be content with memories and bad quality picture postcards. Here are a few glimpses of the Dilwara temples courtesy Wikimedia commons. More on the other places at Mount Abu and tips for travelers in the next post of this two-part series. To read click here. Rajasthan – a state that was truly royal. A trip to Udaipur and Jaipur left me feeling proud of the heritage we have and increased my wanderlust in exploring more of India. Udaipur – a charming city with shimmering lakes, ancient architecture, grand mansions and plenty of folklore. We got off the airport and were able to promptly avail taxi services at the airport. Our taxi driver and guide Rais Khan started our trip with taking us to the famous Nath Dwara mandir which is a temple of Krishna and more popularly Srinathji in those parts. We had around two hours to kill before the gates were opened to the hordes of devotees. The area was like any other religious area really. Rows of shops with artifacts to be used for worshipping, plenty of silverware, idols, marble besides the paraphernalia of the photos of Srinathji ofcourse, along with religious dvds etc. We had the most wonderful chai that we have ever had at a little chai tapri there. The chai vendor’s secret ingredient was Mint leaves! I tried it back home immediately, and I highly recommend it! Well, we waited and waited, with the throng of devotees, right upto 15 minutes before the gates opened.. and then, much to Sandeep’s chagrin, I freaked out from the charging crowd, and I actually backed out! Oh well, I tried My Lord! I hope we still have his blessings! Udaipur and Jaipur, we found were cities replete with plenty of stories. We were told stories of grandeur of the existing royalty of the family owning whole huge palaces, dozens of vintage cars, private jets, and even private airports! We heard stories of how Kokilaben built an entire town around a new temple she built adjacent to the Srinathji building, stories of the many filmstars weddings that now favor the grand Udaipur palaces for venues. Particularly interesting was the tale of the two royal princes of Udaipur in which we were told that the elder heir to throne had been thwarted in ascending the ‘throne’ and hardly received anything from his ancestor whereas the younger brother got all the wealth and title of King. Our driver told us how the people of Udaipur still stood by the wronged elder brother and respected him as King even though he had not received all that his brother had. In Jaipur, the story was of that of the young teenage King whose princess mother had married a driver or commoner, and hence, her King dad, passed on everything not to her and her husband, but to the little prince. These stories were all set in the modern day. Besides these were the stories behind each building, each mansion, and each structure in the forts around these cities. Where Rana Pratap and his loyal horse Chetak, were the subject of stories, memorials, and statues in Udaipur, it was Sawai Mansingh and Jaisingh who left their legacy at Jaipur. We boated on Lake Picchola and marveled at the gorgeous landscape with grand palaces, mostly now heritage hotels, in all directions. Particularly spectacular was the lighted up Taj hotel in the shimmering waters of Lake Picchola. Being monsoon, the lakes were full, and it was surprising to note that the desert state of India was probably more verdant than Kerela! We proceeded the next day to visit the City Palace, still owned by the Maharaja of Udaipur. After a tour of the mansion, we banked for a bit on the shores of lake Fatehsaagar which was close to our hotel, had more chai, and then went to Bagori ki haveil to see some folk dances. As a pointer to future tourists, the show is from 7 pm to 8 pm and is certainly worth a visit! Our last stop at Udaipur was the lofty fort of Chittorgarh which I shall keep for a separate blog. In very few words though, Chittorgarh was one of the most impressive forts I have ever seen. On the downside, it was disconcerting to see the number of cows on most of roads left stray by their owners to fend for themselves in order that they did not have to waste precious space on them. Apparently if the cows got rounded off, the owners were happier since the expensive cattle feed got taken care of at the shelter. Thus, sadly the government stopped catching the cows, and the owners had their own way. It is little wonder that foreigners have this pathetic image of India with cows sitting all major road junctions without batting an eyelid! On visiting Udaipur, I finally see why! For pointers on where to eat, our driver unfortunately did not take us to the kind of places we would have liked, but the one place I would recommend is the lunch with a vintage touch at the vintage car museum. The Rajasthani thali was delicious and the vintage car collection incredible! We also had an animated guide who quizzed us on Vintage car trivia and made our experience fun! All in all, a wonderful trip, and we left for Jaipur in the convenient night train with memories of the shimmering palaces around the tranquil lake Picchola. This post is republished from my other blog Richland Talk. The Nizam’s city of Hyderabad is famous for many things. Biryani, Chandrababu Naidu, Satyam, the Charminar and the Golconda fort. I have visited Hyderabad several times for a day’s trip to the corporate Hitech city so aptly named for all the major IT firms that are housed there. However, I never had the opportunity to stay for more than a day at work. The past week however, I got a chance to go around seeing this buzzing metropolis of Hyderabad and getting a feel of what it was even if it was for just a few hours in the wee morning. Hyderabad is divided into five parts – east, west, north, south and the central zone. The picturesque Hussain Sagar lake with its tall misty fountains and the Buddha statue in the middle is at the center of the city. Most affluent neighborhoods such as the Banjara hills, Jubilee hills etc. lie around the lake in the central zone. The old city of Hyderabad lies at the south of the Musi river and is vastly different from the cleaner Hitech city, Banjara hills, and cantonment part of Secunderabad. For the couple of hours I had, and with the couple of foreign visitors accompanying me, I decided to go to the Charminar, the Birla temple and the Hussain Sagar lake. Charminar is much touted as the symbol of Hyderabad and is displayed magnificently on travel posters at the airport and outside. Quite honestly, as I neared it, I was totally not impressed. Apart from creating a hype about it the Andhra Pradesh government has done nothing to maintain it the way it should be. This ancient structure which was built by Sultan Qutb Shah more than 400 years ago is in the sorriest part of the town. From the outside, its walls look crumbling and dilapidated and a tiny not-very-old temple is built right adjacent to it and sadly is the cause for many riots. The market is not clean, and hawkers, and beggars throng the streets jeering at and harassing tourists. The day after my visit, there apparently were even riots and police firing happened around there. It is a pity that such a highly touted tourist spot is in such a sensitive area to scare away any tourists and is simply not secured or preserved well enough. Even taking photos wasn’t as simple as it should have been with the milling traffic and crowd. The market nearby, the ‘Laad Bazaar’ was just opening up when I went and I hear there are lots of bangle shops, pearl shops and in season, kite-maker shops. The old mosque, the Mecca masjid near the Charminar looked much more ancient and charming than the Charminar itself, but again, we could not go in because of much scaffolding and maintenance work going on there. Our next stop at the Birla temple was much nicer. 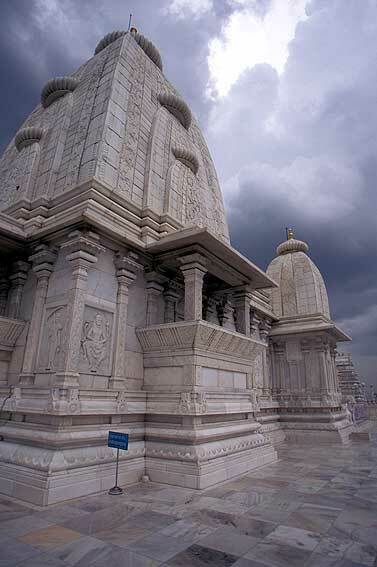 The Birla temple in Hyderabad was built of lovely pristine white marble. The temple on a hill offered panaromic views of the city in several directions, and one could see how the city of Hyderabad had grown in size over the years. We took a final round of the city around the peaceful Hussain sagar lake before we returned to the hi-tech city. The Golconda fort – check the lights and sound show in the evening which is supposed to be quite good (and really as told by other tourists and not just as advertised). The fort will take a minimum of 2 hours to see. The Chowmahalla palace in the old city is a great place to see and I had many recommendations to visit this. If you are a museum fan, the Salar Jung museum, one of the biggest museums in India is the place to go to. For a whole days visit, the Ramoji film studio is a fun theme park to hang out and see different film sets from different eras. Guided tours can be booked right from the airport. Eating options – Being a modern city, Hyderabad has plenty of places to eat for all palates. Hyderabadi Biryani is particularly very famous. To eat the best biryani, do go to the immensely popular ‘Paradise Biryani’ at Secunderabad where they even pack the biryani in special packages for travelers! Don’t forget to pack baked goodies, particularly dry-fruit biscuits from the 60 year old Karachi bakery to share back home. On the way back, I particularly enjoyed the ‘idlis’ of Idli Factory at the airport with all their accompaniments of different ‘chutneys’. Overall, I was quite impressed with most areas I went around in. The Hi-tech city, with all its IT software parks, beautiful roads, hardly felt like the dusty, grimy India that is better known! The Banjara hills and the Jubilee hills are a verdant mass of foliage and beautiful houses. I wasn’t exactly wowed by the 2-3 touristy places I went to, but I liked the overall feel of the city to want to visit again. Busy days, late hours and horrid traffic left me and hubby SS exhausted on the Friday evening. Thus came many pleasurable and contented ways of spending our weekend. That of ‘relaxing at home’, ‘chilling out with a dvd’ and getting chores done. With the onset of winter and chill in the air, we finally decided to finally get out of our contented monotonous chilling at home and explore what was closest to us – the city of Mumbai. What first came to our head was the symbol most popularly associated with Mumbai City – The Gateway of India and and decided to start with areas around it. It was walk down memory lane for me as I passed the legendary Regal theatre and the Alibaba Restaurant that was adjacent to an office where I once worked right after my engineering on the way to the Gateway. It was wonderful to walk on Colaba Causeway and hear the vendors speak expertly in English and French and still see them target only the white tourist population and almost ignore the brown skinned locals! The array of gaudy necklaces, trinkets, scarves, marble and wooden showpieces that have not changed for a long time now continued to be there and continued to fascinate me. Only most of them were pretty pricey targeting a dollar audience dollars and not for local Indians! Right across the Gateway of India, The Taj has stood like a shining beacon of lovely architecture in Mumbai city and a balm to eyes tired of filth, peeling paint, slums and box like buildings with matchbox apartments. From the Gateway it looked grand as always and a testimony to what Mumbai has withstood, repaired though not healed. The luxury hotel has attracted distinguished visitors in Mumbai and it was always a pleasure to enter its luxurious, and rich interiors even if it was for just a cup of late night coffee or for a conference in one of its grand ballrooms. Coming back to the Gateway of India, my earliest memories as a kid were walking right under the Gateway and buying puzzles, tricks and such paraphernalia from a thriving market of encroachments even back then. Now, amidst security concerns, there is a large police barricade and siege with elaborate screening, constant security vigil and a heightened awareness although it was fortunately pervaded by much laughter and photographers asking couples to make various funny poses to hold the Taj and the Gateway. The Gateway of India was built to commemorate the visit of King George V and Queen Mary to Bombay back in 1911, a 100 years back from the approaching March 11, 2011. The last of British troops to leave India also passed through the Gateway in 1948. In earlier times, the Gateway was the first glimpse of Bombay that visitors arriving by Bombay would get. The architecture of the Gateway is Indo-Gothic representing the cosmopolitan culture of the city of Mumbai even today. Our next destination was the famous Elephanta caves, which are on an island across Bombay, reachable by a ferry ride in the sea from the Gateway. It is funny how most locals including us have never seen these caves despite residing in Mumbai for so many years. It never helped that that those who had visited only disparaged the place saying there were just a few broken idols and little else to see. Well, but look at it this way, it really is fun to be a tourist in your own city and see things from a new perspective, understand history and see where the roots of your city indeed lie. The Gateway is one part of understanding the city, the Taj another and the Elephanta caves set in an era long bygone adding yet another dimension to this huge city. Cruising in the Arabian Sea on an hour long ferry ride, fanned by a cool zephyr, watching the Mumbai skyline recede and trying to make out major landmarks in the city all added to our really touristy experience. We reached the Elephanta Island by boat and clambered on a toy train which really ran the distance of a 5 minute walk but was again, a part of the experience! We then had piping hot tea from the ubiquitous tea stalls and then proceeded to clamber the many steps up the hill that led to the caves. As usual, the entrance all along the steps was lined by a huge market of souvenirs that sold everything that can be found at any souvenir market in India I suppose. We saw rows and rows of endless ‘handicrafts’ that we had bought foolishly in Rajasthan at high prices as something unique and refused to buy more ‘unique items’. We finally reached the caves and found a guide (unauthorized guy since there were no official guides!) to tell us the history of the place instead of us looking blankly at the statues. We learned that the Elephanta Island as it was now known is known originally and referred to by locals as the Gharapuri Island which means literally island of caves. The island consists of Hindu and Buddhist caves with the Hindu caves depicting tales from the life of Shiva. The Portuguese called the island Elephanta on seeing its huge gigantic statue of an Elephant at the entrance. The Statue is now placed in the garden outside the Jijamata Udyan at Byculla in Mumbai. This cave was renovated in the 1970s after years of neglect, and was designated a UNESCO World Heritage Site in 1987 to preserve the artwork and is currently maintained by the Archaeological Survey of India. If the Portuguese used the sculptures for target practice blowing them up for most part, Indian ruffians scribbled and carved their names and declared undying love to their beloveds and desecrated the statues. ASI has done a good job however in cleaning up a majority of these names, though on close scrutiny, one can still make out English letters in the haze. The guide told us several interesting stories about the sculptures most of which could be confirmed by the guidebook or Wikipedia. The ones I liked are Ravan lifting Shiva and Parvati on Mount Kailash, Wedding of Shiva, Shiva slaying a demon named Andhaka, and the most famous one, the Trimurti. The Trimurti is a 20 ft rock sculpture that depicts a three headed Shiva manifesting creation, preservation and destruction and thus the three important deities Brahma, Vishnu and Shiva respectively. It took us around 2 hours to go around the entire place, take photos and listen to stories besides indulging in chai, and look at knick-knacks in the souvenir market. The ferry service starts early in the morning and continues till around 5:00 pm in the evening in winters. I suppose this time gets extended in summers. The ride back thrilled us again as sea gulls swept up and down, and in circles with their cries over the lapping waters. We disembarked at the Gateway and headed back into the chaos of the city. With a few hours left to kill on that perfect weekend, we ate pav bhaji at one of the tiny restaurants at Colaba Causeway, ate a really yummy looking pan and watched a movie at the historic Regal theater. I would definitely recommend this trip to anyone who wants to become a tourist at Mumbai. Go Out Mumbaikars and take that ferry ride! I recently visited Indore, the commercial capital of the state of Madhya Pradesh. Indore is possibly the food capital too. Of all the highlights of the visit, eating blurs out all other memories! Indians are overly fond of snacks and sweets and at Indore more so. I had taken the Duronto Express train from Mumbai to Indore. The cheerful looking colorful train set the mood for a fun visit and I was not disappointed. I reached Indore at about 11 a.m and was welcomed by family with steaming chai,warm jalebis and ‘Alu Kachoris’ and Poha. After this heavy meal, I was surprisingly hungry in about a couple of hours again and ready to eat! I am told the ‘Indore ki hawa’ or atmosphere at Indore is naturally stimulating to eat more and food gets digested faster! Well, I don’t think I disagree as I almost always had room for more for each of the meals and the variety of food I had. One of the highlights and must-do’s of Indore is a visit to Sarafa. Sarafa is an area in the old town on Indore near the Rajwada or palace of the Holkars. Originally a market of jewelers, Sarafa is now known as the foodie bazaar. Late in the evening at 9 p.m when businesses start closing down, jewelers down their shutters, Sarafa starts getting festive. Smells of gulab jamun, and hot frying oil start wafting and appetites are aroused. Traditional ‘Chaat’ houses open and sweet sellers sit with their huge assortments of freshly made gulab jamuns, rabdi, kalakand and malpuas. One can see people gorging on ‘Kachoris’, ‘Samosas’ and ‘Tikkis’. Along side the traditional chaat places, a slew of cuisines have set up shop in the form of Indo chinese stalls, Sandwiches and Pizza stalls. ‘Samosa’ chaat – Samosas are dough stuffed with a spicy potato filling in triangular shapes and fried. Accompanied by a chick pea gravy, onions, coriander and tomatoes, makes it a ‘chaat’! Pani puri – Known by various names in different parts of the country, Pani puri is one of the most popular dishes found at the roadside stall. Thin hollow dough crispies are stuffed slightly with a potato or boiled chick pea filling and dunked in sweet and sour spicy water, one at a time. Each individual stuffed puri is eaten whole at a time. Alu Tikkis – Potatoes are a favorite ingredient for all chats. Mashed potatoes roled into balls or chopped potatoes, are deepfried, sprinkled with spices and served hot. Papdi chaat – Dough crispies, this time flat, are know as papdi or puri again. Loaded with potatoes, onions, puffed rice and some sauces and ‘sev’ make for a papdi chat. Kachori -Kachoris are round dough balls stuffed with ‘masalas’ and some base ingredient of mashed peas or lentils or potatoes. Kachoris can be eaten dry or with the usual chat accompaniments of onions, tomatoes, coriander, ‘sev’ and chutneys. Well, chaat is ubiquitous in all of India, but Indore certainly had a fabulous ambiance that made us want bite into sweet and spicy savories. Apart from the chat and the roadside stalls, Indore is also very famous for its ‘Namkeen’. Namkeen is a term given to long lasting savories made of flour and subtly flavored with cloves, garlic and several spices. Even more tantalizing at Sarafa were the sweets that were sold openly. Mostly made in pure ‘desi’ ghee, even looking at them was a feast to the eyes. You can get notably jalebis, imartis, gulab jamuns, malpuas, rabdi, kulfi, kalakand, and cold or hot drinks made of milk. A unique drink was known as ‘Shikanji’ which was a veritable mix of all the goodness in milky form there can be! Shikanji is made of evaporated milk, rabdi, shrikhand, and dry fruits making it very delicious. With the advent of winter, a host of other goodies such as mattar or pea kachoris, ‘gajaks’ and hot milk products are also available and must-eats! Apart from Sarafa, another popular hang out for youngsters in Indore is ‘Chappan Bazaar’ which originally consisted of chappan or fifty six shops. Although the variety of food was similar to that of Sarafa, the feel of the place was new and less charming as compared to Sarafa. One would think we would end up with upset stomachs at the end of all that feasting, but thankfully, we all returned well satiated. I am keeping my fingers crossed that I soon have a chance to go back again just for those steaming hot kachoris and melting-in-the-mouth malpuas. My advice if you are planning a trip to Indore is to be that glutton you always wanted to be and have a feast! Sale! Discount! Unbeatable deals! When it comes to unbeatable deals at wholesale prices, it’s gotta be the wholesale market itself! For the uninitiated, Mumbai’s biggest wholesale market is the Crawford market that draws eyeballs, pockets and mindboggling quantities for plenty of shopping. I stood outside the Crawford market taking the scene in. Cars screech, Bikers honk, people get on and off buses in a cacophony. A tourist bus screeches to a halt as sunburnt tourists stand in a file gaping at the chaos. People walk around with large sacks. Some like me frenetically click pictures in black and white, sepia and color standing at weird positions across the road trying to keep the chaos out and the market in! I entered the Crawford market expecting more madness. Instead of chaos I found and insane number of shops and goods selling their wares perfectly peacefully! You think your neighborhood mall has a lot of ‘imported’ and exotic foods? Check out Crawford market for the sheer variety of things you can buy – types of pastas, sauces, exotic dry fruits including pink cashewnuts and green cashewnuts, chocolates, cheeses, oils of all kinds and cookies from around the world. For a long time, elite south bombayites visited this market for imported perfumes, toys, accessories, luxury soaps, detergents, gifts and cosmetics. It is interesting to still see Persil detergent boxes, the array of perfume shops and the beauty products. Go there just for the heck of seeing how big a market can get! Go there to see another example of architecture after seeing the jhuggis and jhopdis in Mumbai. Visit it to go to another piece of history – the Badshah Juice center which stands there since 1905. You cannot miss out on their famed ‘Falooda’, the rose/saffron flavored drink with vermicelli and jelly and ‘sabja seeds’ at the bottom and laced with icecream and nuts at the top.oooo. yum! Crawford Market earlier named after the first Municipal Commissioner of the country, in the spirit of renaming all that sounds ‘British’ is now officially named as the Mahatma Jyotirao Phule market after the social reformer. However, the powers that ordain these things have not been successful in getting anyone to call it anything but the Crawford market! A Grade 1 heritage structure, the Crawford market was designed by Lockwood Kipling, father of the famous novelist Rudyard Kipling. This building is a blend of ‘Norman’ and ‘Flemish’ architectural signs designed beautifully to allow plenty of natural sunlight, air and shoppers! Don’t miss the impressive frieze on the main entrance that delineates peasants in fields or the charming clock tower. At the Dryfruit store. Check out the pink cashews! Take a local train or Bus to CST) and cab it after that. If you insist on taking your car, try and park far away and then cab it since parking can get expensive (Rs 80 per hour!) in peak hours. Carry lots of cash, since paying by credit card might not be an option. Haggle. Haggle. Haggle. Even if you think you are getting a good deal. It can get sweeter. Happy Seeing, Shopping and Saving! P.S. – This post was published in DNA in its column ‘Around the Blog’.